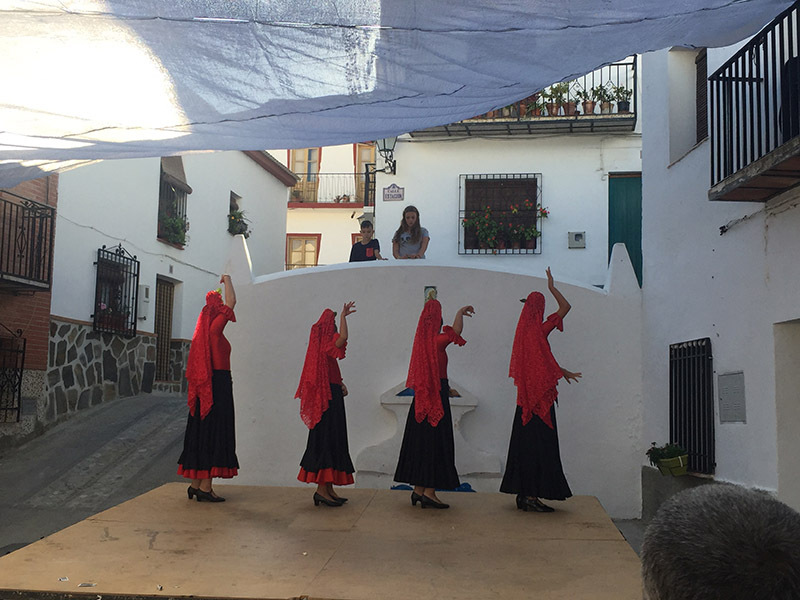 This time last year, we wrote about the annual Fiesta held in Saleres, and how tricky we found it trying to work out when the locals actually came out of their houses to have a party. Every now and again, we ventured out of the house and wandered timidly into the main square to see if the festivities had kicked off, only to find a mere handful of doughty villagers looking somewhat lugubrious around the makeshift bar. Last year, a duet with gutsy voices performed to a tiny audience of seemingly unappreciative village elders. 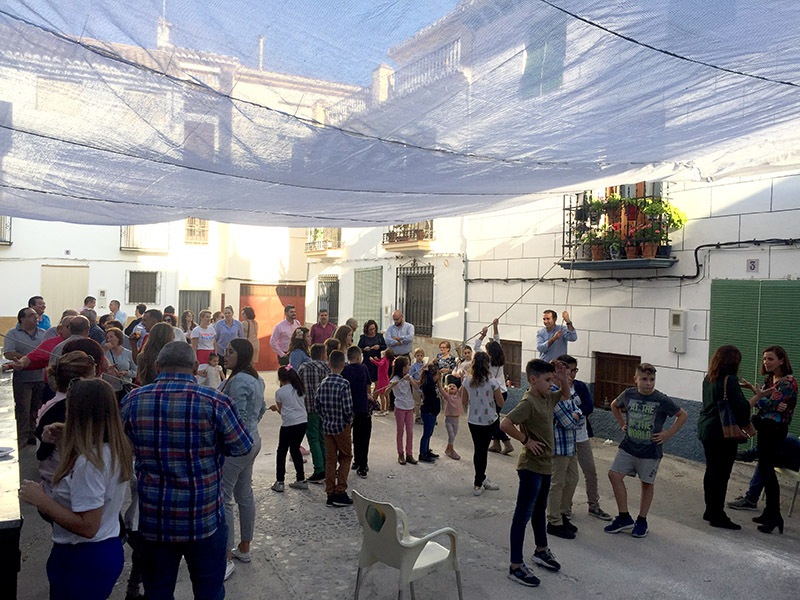 Of course, this year, Saleres has its own bar once again, and thanks to the combined efforts of Keisa, Maria Gracia and family and other villagers, the annual fiesta was centred around El Remojito (the bar) and was a packed celebration of life in the village. 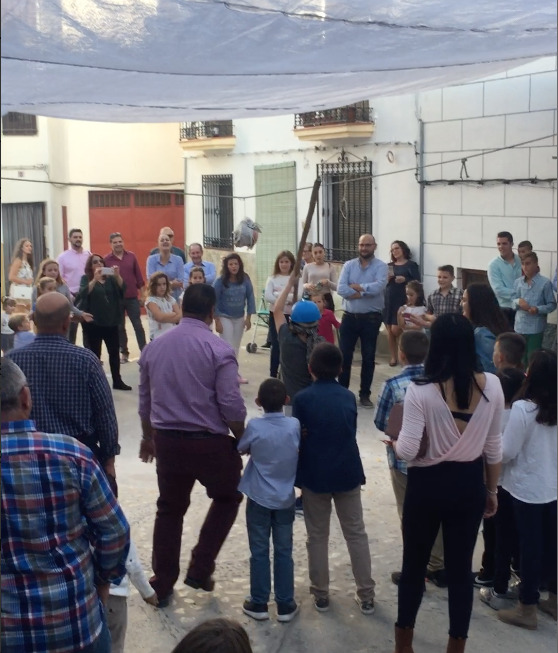 La Función de Saleres takes place every year over the last weekend in October to celebrate Santiago Apóstol and la Virgen del Rosario. We were not in the village on the Friday evening as we were spending our last night in Granada before our return. We got back to Saleres on Saturday, had a frenzied unpacking session, whizzed to Mercadona to replenish the larder shelves (a newly resident mouse had taken a fancy to much of the dried produce we had left behind), and then prepared for the action. This year, El Remojito published the itinerary on their Facebook page, so it was far easier to discover what might be happening and at what time. From the schedule, we knew that a band would be playing on Saturday evening, and it didn’t appear to be the duet from last year. It was to be a band called Orquesta Manigua, hailing from Granada. When we strolled down to the square on Saturday afternoon, there was all sorts of activity. The band’s ‘roadies’ were erecting a stage that would not look out of place at Glastonbury. There were lighting rigs, an engineer’s desk, an LED backcloth, and speakers that threatened to blow out the houses at the far end of the square. The bar was up and running, and tapas were being served, and everything looked well planned and efficient. Of course, we had a quick drink before repairing home for a minuscule snooze. We caught up with our lovely neighbours, Visi and Clemente, in our back yard (not a euphemism), and we were regaled with tales of woe regarding leaky water pipes. Fortunately, these have been repaired, although the patio is now a network of trenches that have been badly filled in. Visi and Clemente, once slightly sceptical about the new bar, told us that they would be in the square later that evening dancing with the best of them. We couldn’t wait. The procession started at 9pm, taking the same route as every year. 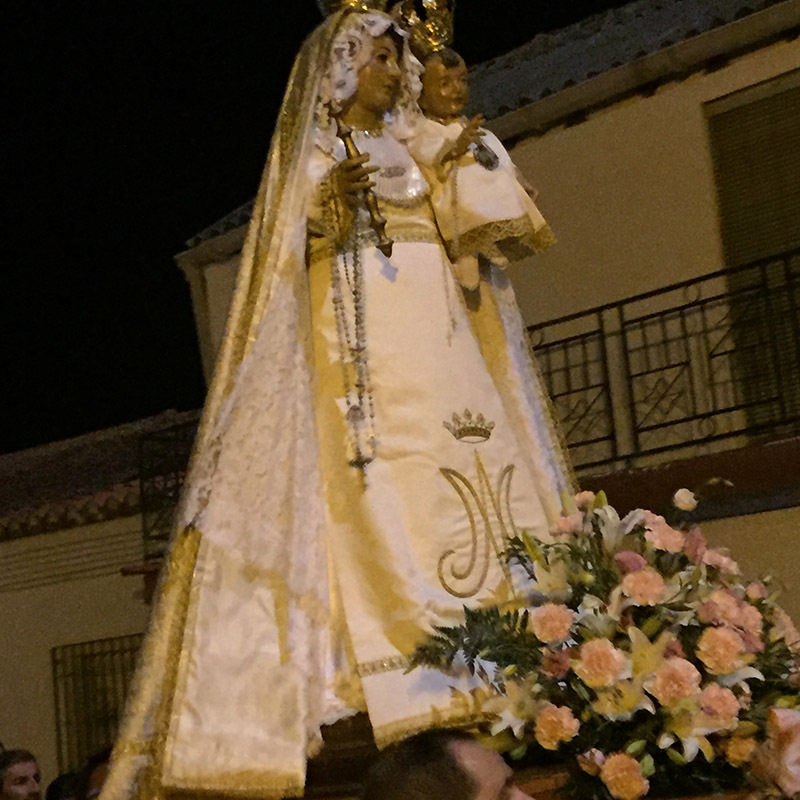 Santiago Apóstol and la Virgen del Rosario are brought from the church and paraded through the tiny lanes of the village and out to the outer reaches (which is not very far, truth be told). The crown on top of La Virgen’s head was unceremoniously toppled by a low-hanging cable, and concerned villagers followed waiting for an opportunity to re-crown the icon. The procession was accompanied by a brass band and the throng of villagers and their respective families followed behind. This year, the atmosphere was so much more celebratory, and the general babble and bustle around the village was tangible. Last year, there was a slightly sad, neglected mood. After the procession, we nipped back home for something to eat as we knew the band was not scheduled to perform until 11pm. When we sallied forth at the allotted time, the band was still not quite ready, but the square was filling up nicely. It was fabulous to see everyone out, enjoying the bar and watching the final touches being made to Saleres’ answer to the Hollywood Bowl. 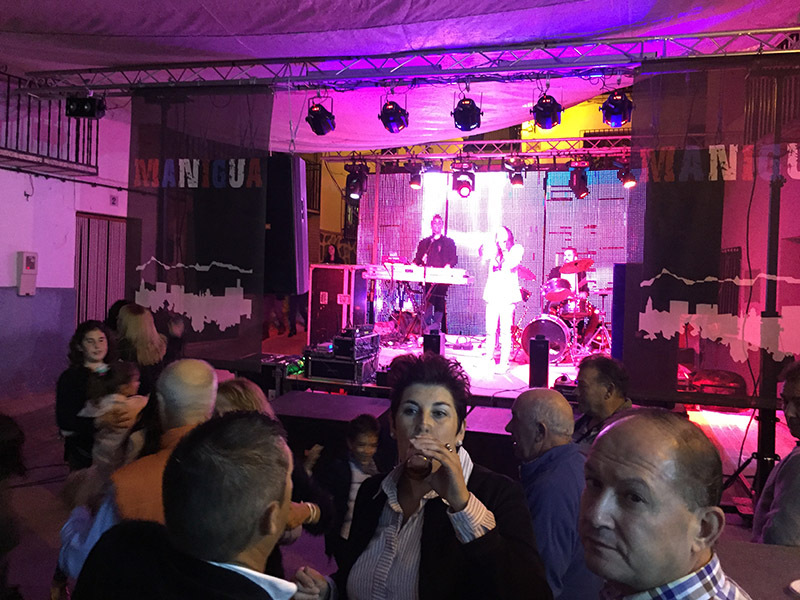 The engineer took his place, and the band appeared - a keyboard player, drummer, a male vocalist and two female vocalists who were not quite dressed for a chilly autumn evening…. The music was fabulous! Very Eurovision with a lot of traditional Spanish popular music, much of it well known to an appreciative audience. It took no time at all for the villagers to grab a partner and start to whirl and swirl around the square. Sure enough, at the front, there were Visi and Clemente in an embrace and stepping precisely around to the music. The lights were bright, the speakers not at full volume, and pyrotechnics at the front of the stage threatened to melt the plastic awnings overhead. We have never seen the square so full of people and so much good humour. My cold (I have never once referred to it as flu) has lingered, and so by midnight, and after a day of moving, I had had enough, so I dragged Andrew home. Poor Keisa, the host at El Remojito, had been up on Friday night, all night, and had not got home until 7am on Saturday morning, and I feared that Saturday night/Sunday morning might have been another late one. Needless to say, we lay in bed lulled to sleep by the sound of bangers and the Orquesta Manigua serenading the village throng well into the following morning. The church bells reminded everyone that the weekend’s festivities did have a religious foundation. Chris and Jackie, friends from neighbouring Albuñuelas, were due to walk over at around lunchtime, so we said we’d meet them for the scheduled communal paella at 2pm. After a month in our cave in Granada, it was glorious to lie in the sun on the roof of Casa Magdalena once more, and look across at the hills and the endless blue sky beyond. Sunday morning was delightful. After a fairly relaxed morning, the bangers heralded the start of the day’s fun, and we duly trotted down to the square and the bar. Yes, the bar again! It is, after all, the hub of the fiesta. Once again, the square was filled with people, and it was a joy to witness. Everyone, it seemed, was out, chatting, having a drink, enjoying tapas, and the bar functioned like a well-oiled machine. We met our chums, and eventually tottered down the hill to the riverside where the paella was being cooked. It really is something to see these village fiesta paellas being prepared in the most enormous paella pans over gas burners dragged, seemingly, from Cape Canaveral. 1€ bought a healthy plateful of delicious food (1€!! ), and we sat on a wall, in the sunshine, by the river surrounded by the folk of the valley. 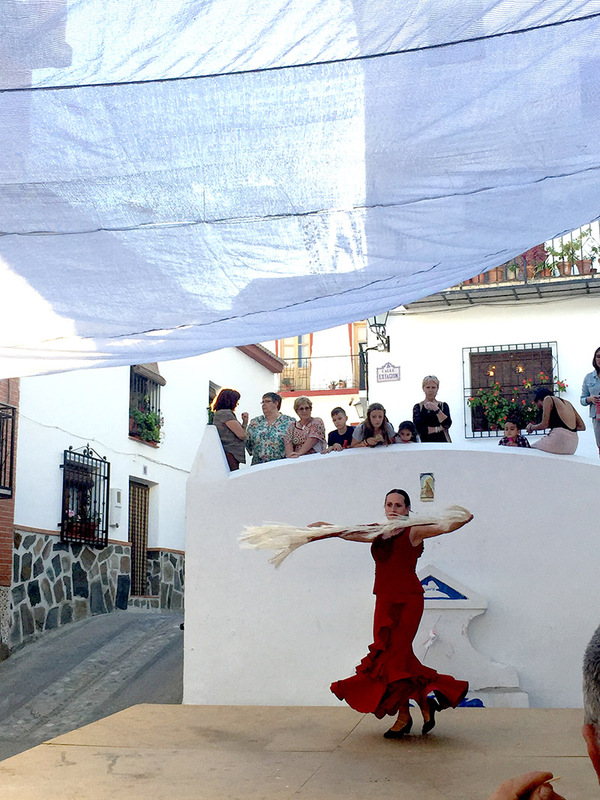 In the middle of the assembled paella-eaters, we caught glimpses of a lady in a scarlet traditional dress looking purposeful. This, we learnt from Jackie, was Rosario who teaches dance and is in Jackie’s language intercambio group. Rosario had brought her troupe of dance pupils to give a display after lunch. The elaborate sound and lighting rig of the night before had disappeared from the stage in the village square, and some of the villagers were now using the platform as a makeshift dining table. The bar continued to slake thirst, and the paella pan was gradually emptied. 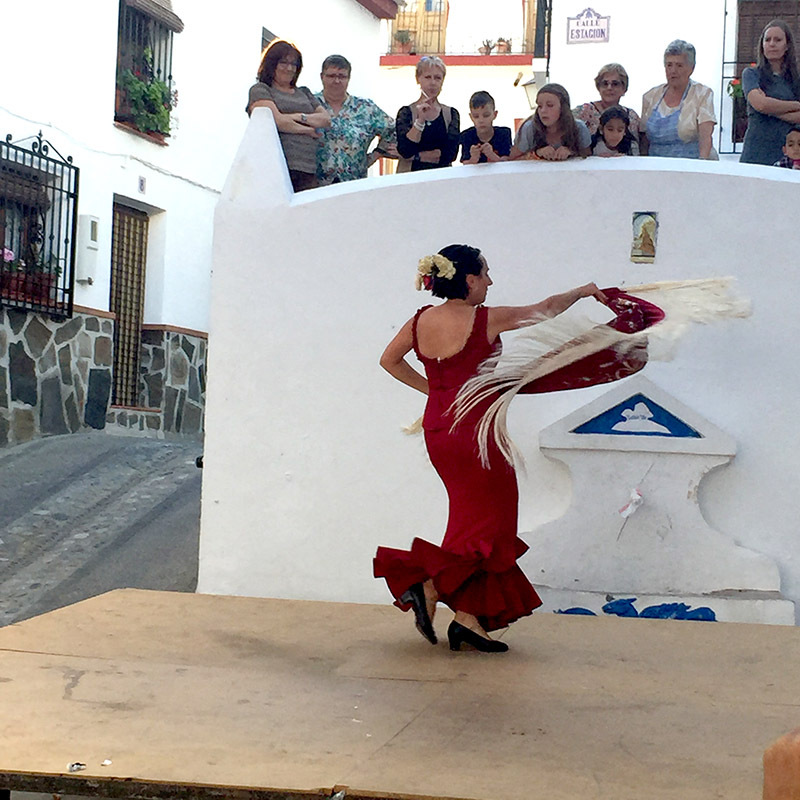 At 4pm, Rosario’s Dancers took to the stage with a series of Sevillanas, and it was rather splendid! 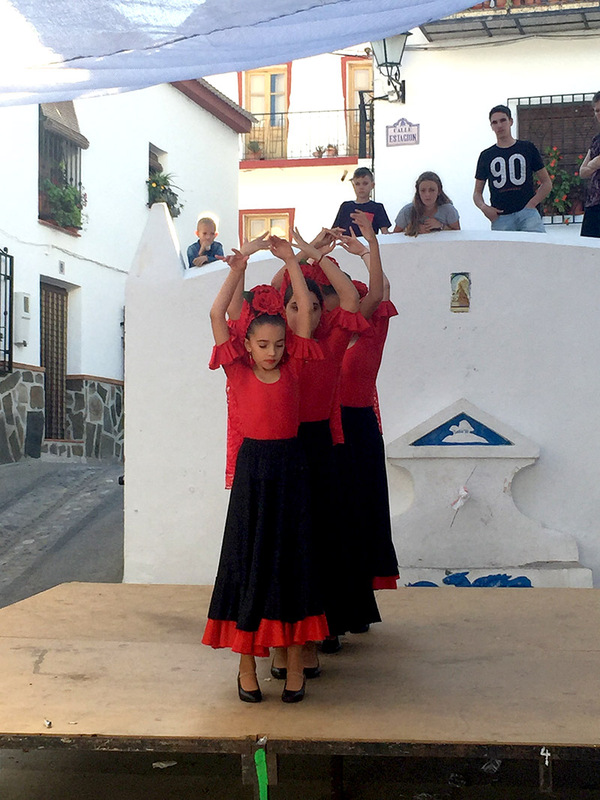 The above might all sound slightly tongue-in-cheek, but both Andrew and I loved seeing the square of our tiny village transformed into a lively, colourful, bustling centrepiece filled with tradition, music, dance and welcome. We lingered, following each caña with another until the sun went down. Like any good Spanish person, we tackled pipas (salted sunflower seeds) casting the husks on the ground. The dancing was followed by a version of piñata, for the children of the village. A rope was strung across the square, and ceramic pots filled with goodies were suspended from said rope. By rote, children were blindfolded and then handed a huge bough from a tree! The armed child then had to whack the hell out of the ceramic pot to release the goodies. It was hilarious to see a branch-wielding child lurch towards to crowd, swinging wildly off the mark. When a child did hit the target, shrapnel of pot scattered into the faces of the excited onlookers. An adult assistant had to run in to grab the stick before it came down on the heads of all the other children who surged forward to grab the goodies that were now scattered on the floor. One member of the audience thought it might be a giggle to lead the blindfolded, tree-bearing children in front of the crowd and tell him to swing, much to the consternation of one of the official organisers of the game. We thought about the sharp intakes of breath from the Health and Safety crew that would meet such shenanigans in the UK. No child was harmed in the making of the afternoon's activities, although one sweet little girl (dressed immaculately) had a melt-down when she was unable to grab any of the goodies, although Jackie did come to her rescue and nabbed her some booty. 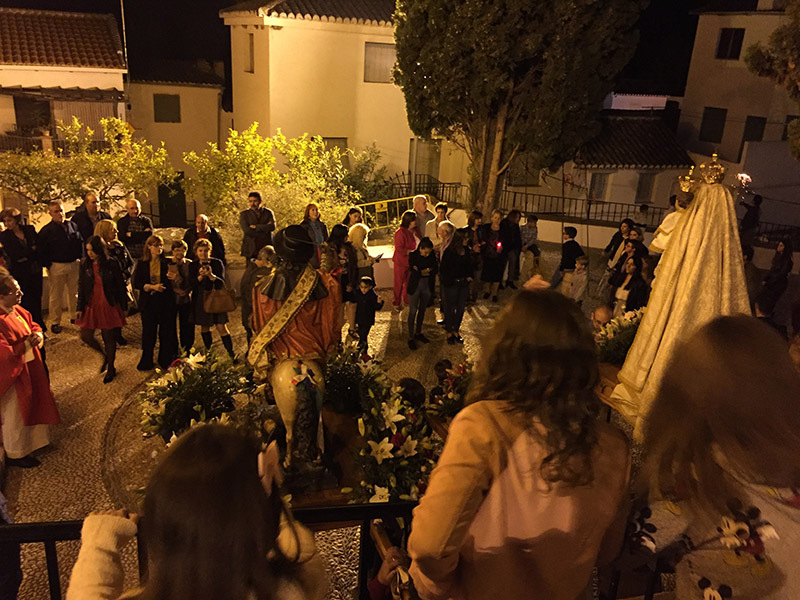 That Sunday evening, La Virgen once again emerged from the warmth of the church to see more fireworks go off at the edge of the village, before being taken back into her home for another year. We went home, too, and felt very glad to be back in this lovely corner of Spain.